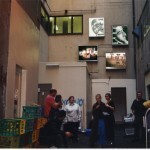 Visionary Image’s first major public art project, launched in Melbourne in September 1999, established it as an organisation to be watched. 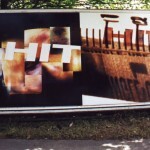 The Billboard Project marked the start of social critique and public artworks that push the boundaries of contemporary art, street art and collaborative community practice. Four images destined for public exhibition as billboards were developed in an eight-month collaboration between young people, artists, designers, youth workers and volunteers. The works explored the impact of relationships, violence, drug use and homelessness. They gave the young people a new way of thinking about their experiences and aimed to counter the negative portrayal of youth prevalent in the media at the time. 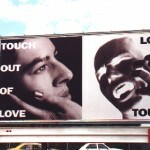 The names of the artworks were ‘Touch Out of Love–Love Out of Touch’, ‘ Hit–Hit’, ‘This Makes Me Feel’ and ‘Home–Less’. 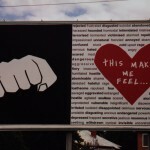 Two of the billboards were first displayed in light boxes in Citylights Centre Place, a public art space in a small graffiti-covered cul-de-sac in central Melbourne’s laneways. All four artworks were later reproduced on vinyl skins and displayed on 6m x 4m billboards in eight locations around Melbourne’s suburbs. One of the images was also printed as 10,000 free postcards which were distributed throughout the city. For the participants, learning these skills within the process of making art became a pathway for navigating uncertainty and personal crisis. What emerged was an awakening of self-identity, recognition of one’s voice, affirmation of the power of creativity, and a recognition of one’s self in community. 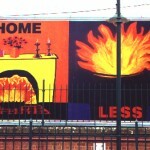 They have gone on to be exhibited at: North Richmond Housing Commission Towers, Melbourne; Brisbane Powerhouse and Bond University, Queensland; Southern Exposure Gallery, San Francisco; Queen Victoria Museum, Launceston; Designing Communities, Melbourne; and at ‘Art Moves’, the 2nd International Billboard Festival in Toruń, Poland, 2009.